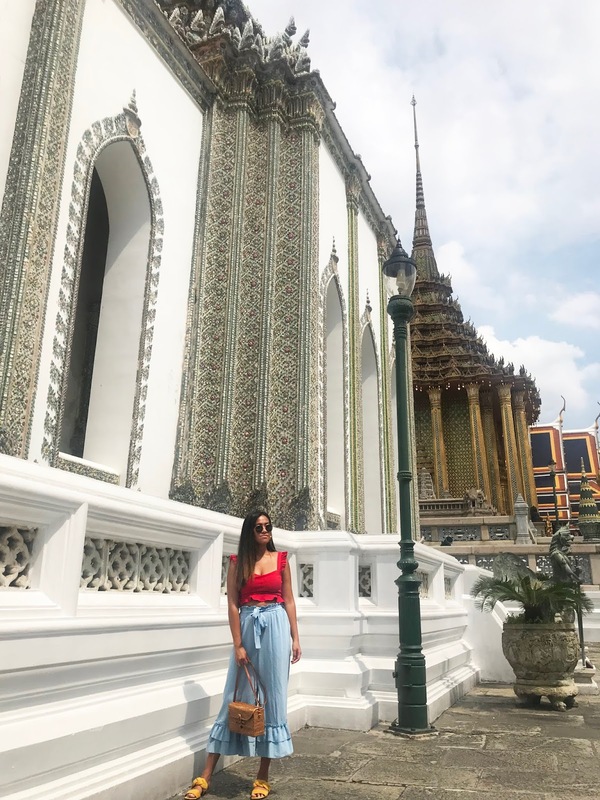 Our first stop of this trip was Thailand’s number one tourist location and capital – Bangkok. From the bustling streets, to the dirty and smelly air – my first thought was it is very similar to New York. Though I must say, Bangkok has some of the most interesting and unique looking buildings; one to definitely admire. This is an absolute must when visiting Bangkok. 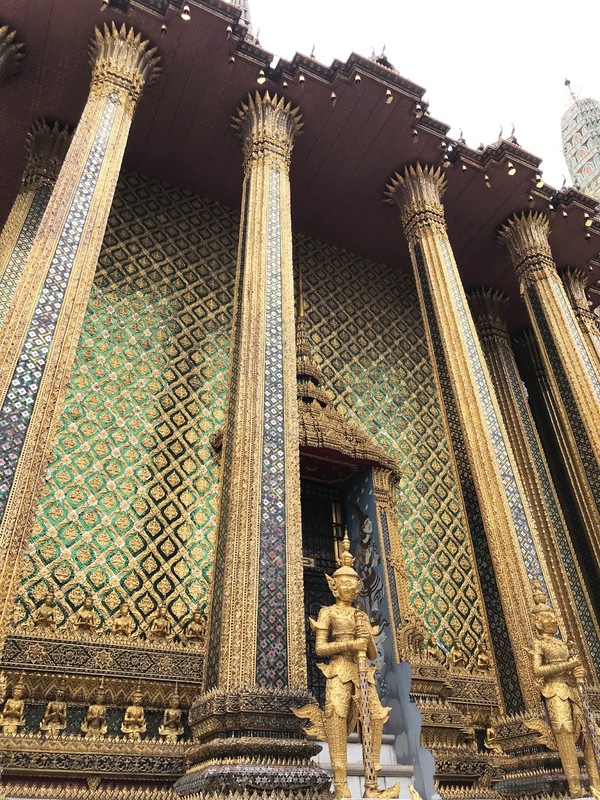 The Grand Palace is Thailand’s most famous and sacred landmark. The palace had been the home of King Siam since 1782. When you visit, you truly will feel like royalty. With memorizing walls and astonishing architecture is worth the visit. 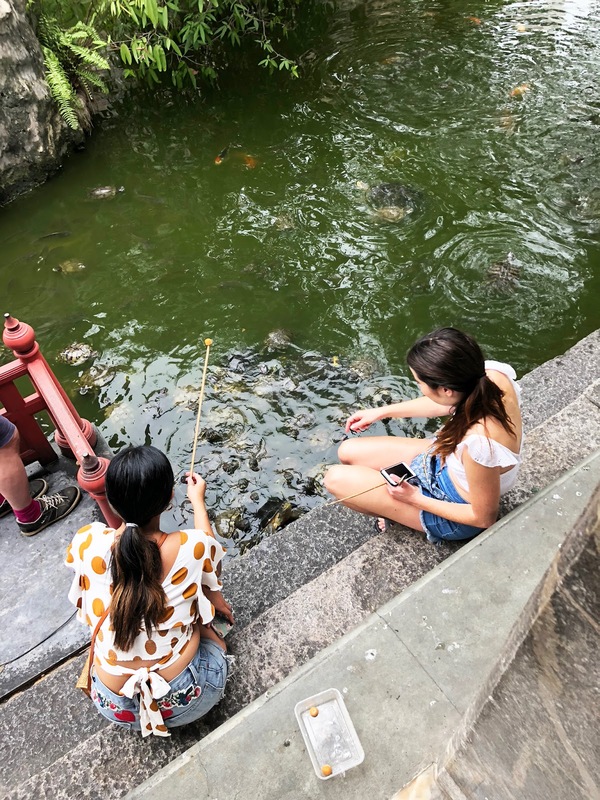 I booked my trip via Voyagin (which has amazing deals for all tours and activities to do in SE Asia) – if you want to take the tour and save money, book here and use code: ‘fnancistapriv’ at checkout for an additional 10% off your purchase. Try to come in the early morning to avoid crowds. Always bring a lot of sunblock because it’s an outdoor event. 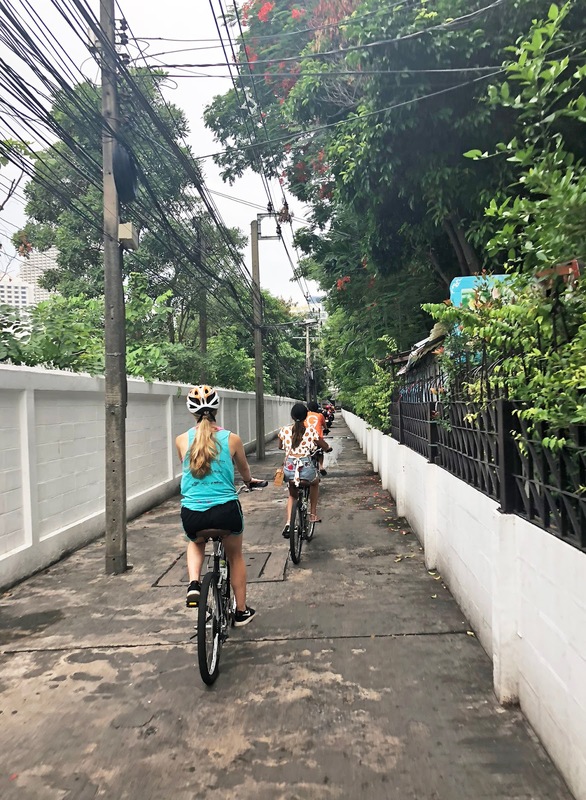 One of the things that had strike my interest when searching for tours in Bangkok was touring the city by bike. I don’t bike too often anymore but like to whenever I get the chance. 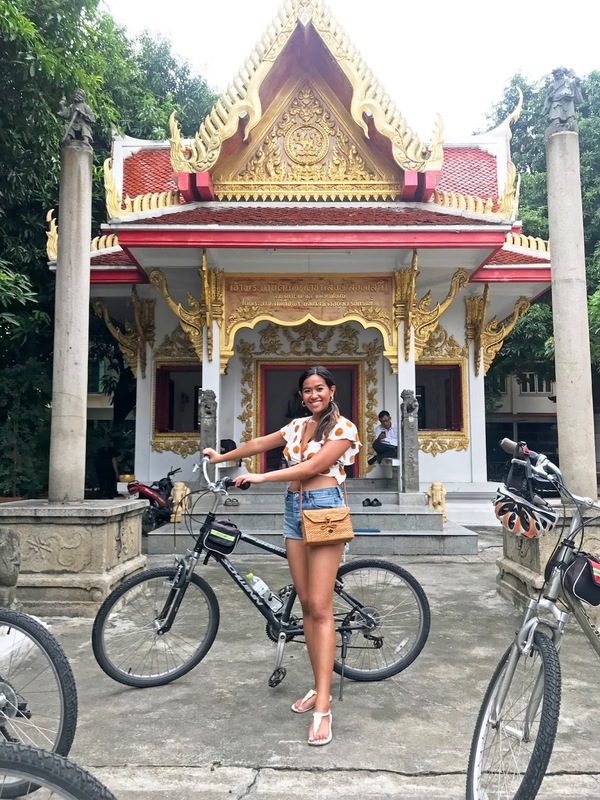 While there are a few bike tours I had found on Google, one that had great reviews and seemed worthy was via Go Bangkok Tours – they offer various tours – we went on their Culture Tour. 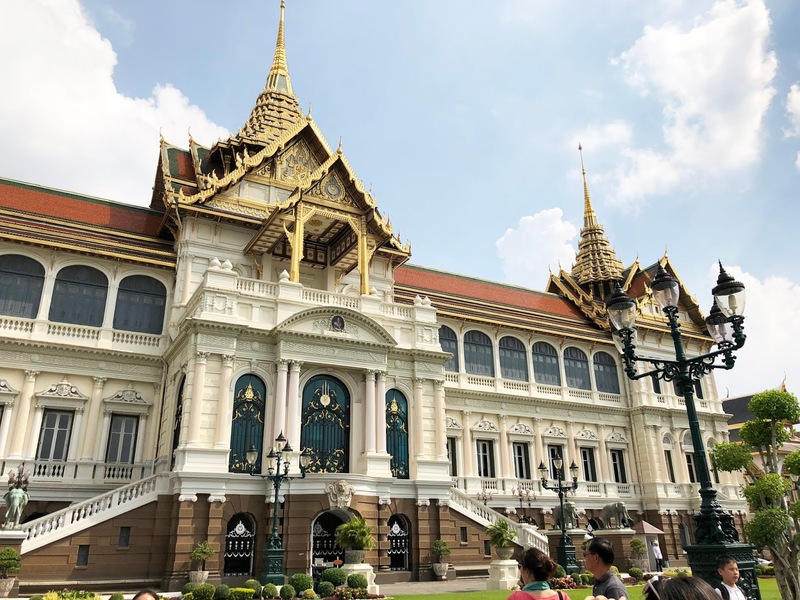 This tour is 4 hours long, and covers a good chunk of the different areas of what Bangkok has to offer. 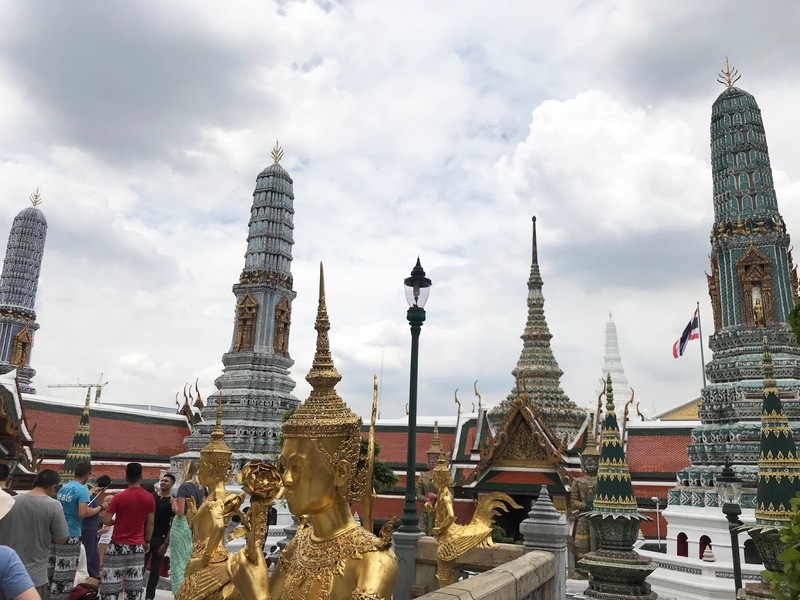 From sightseeing Bangkok’s vibrant temples to the bustling streets of Chinatown; you continue your journey exploring many other wonderful places such as Flower and Vegetable markets, Princess Mother Memorial Park, and so much more! On top of that, our tour guide was thorough and informative. My crew and I learned a lot in just a matter of 4 hours. If you’re looking for a tour to do that’s different and fun, I’d recommend doing this bike tour. These tours can be as long as 6 hours – so book it on a day you have free. Dress appropriately (lesson learn on my part). Bring your camera and have fun! After you bike through the city with a 4 hour tour, you better believe you will be hungry. 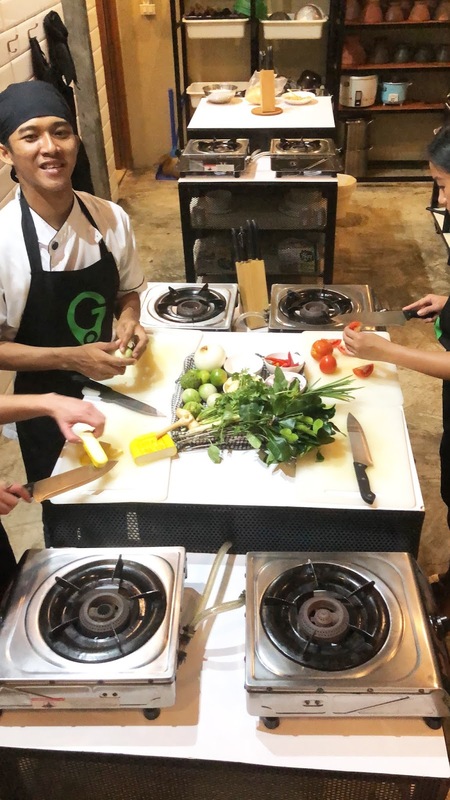 Right after our bike tour, we had the opportunity to take a Thai cooking class which was right above the Go Bangkok Tours building. If you want to do a combo of the bike and cooking class, book here. 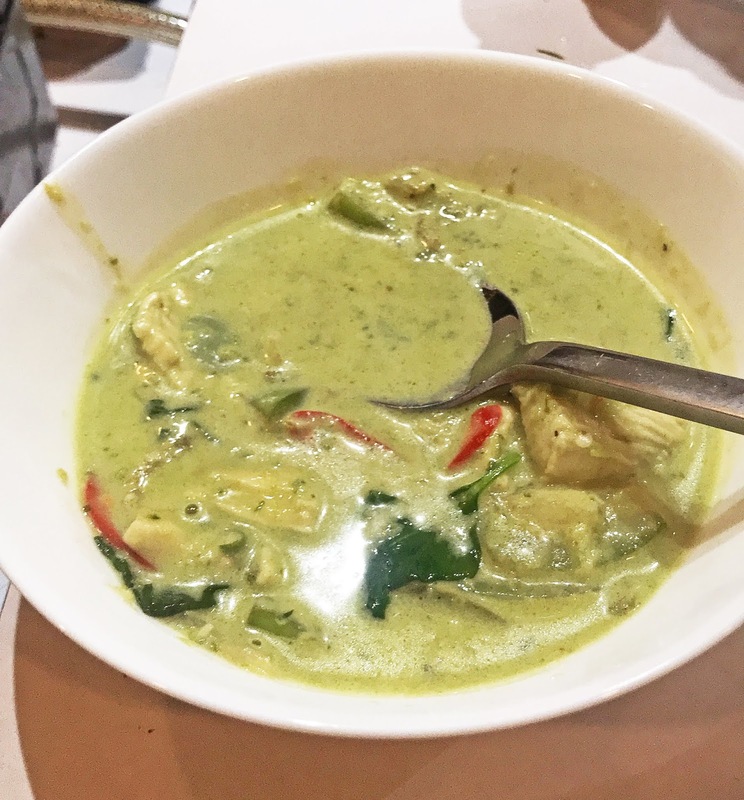 Thailand is most famous for its food, so one of the must do things while there is learning and tasting the exotic flavors Thailand has to offer! This was definitely one of the things on my list to do and it was one of my favorite Bangkok memories to date. 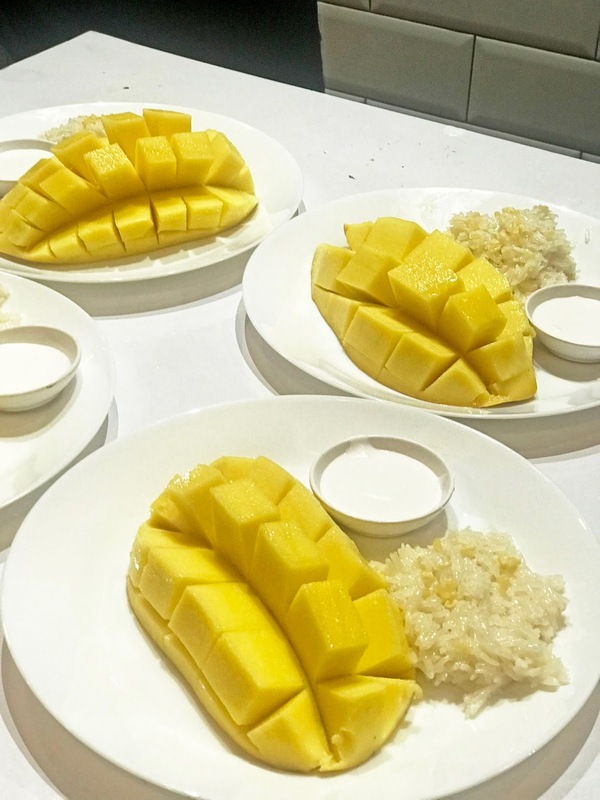 That night we made 4 flavorful dishes: Pad Wood Sen, Pad Thai, Green Curry and Mango Sticky Rice. Whether you're a chef at your own kitchen or want to learn how to cook, this experience is recommended. 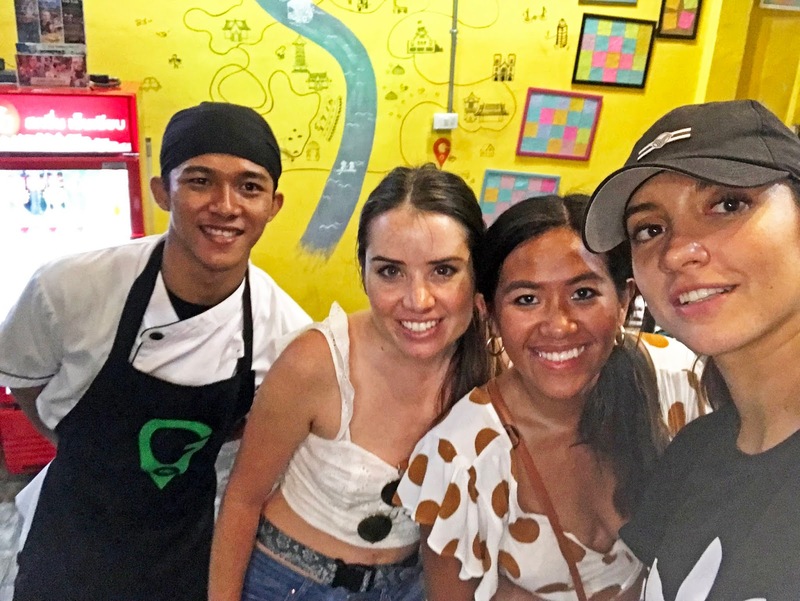 Our chef was light-hearted, informative and it was overall one fun experience! Click here to book now. 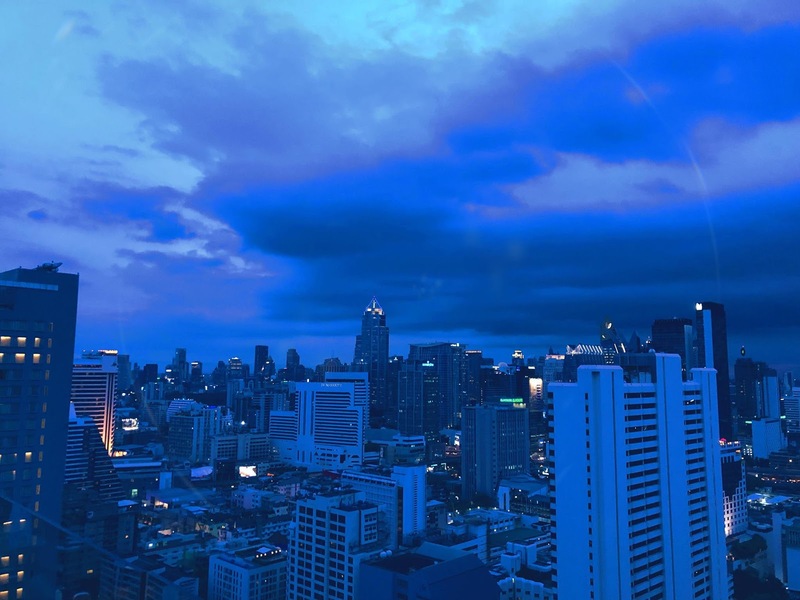 Of course, like many busy and big cities, most are known for their skyscraper rooftop bars – Bangkok included. While doing some research, one rooftop that came to mind is Above Eleven. Above Eleven is definitely a wow-factor. 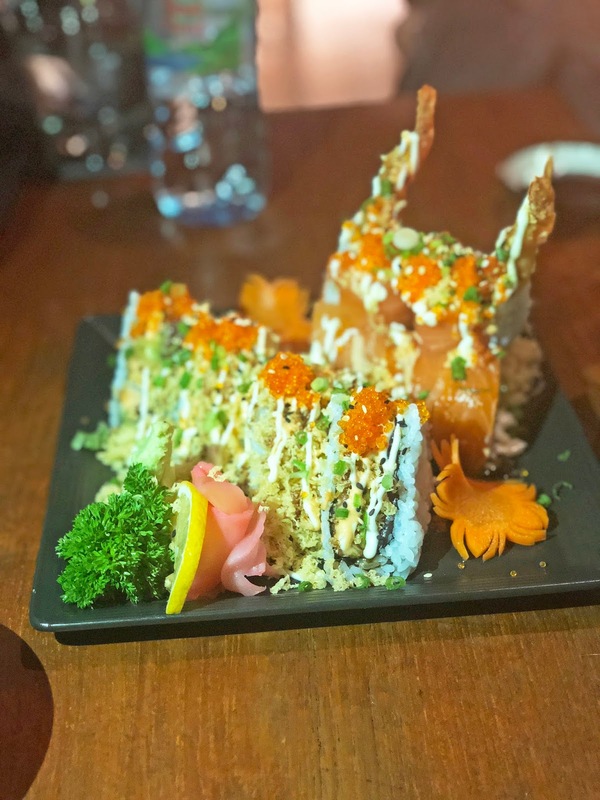 With its breathtaking 360 views, incredible selection of cocktails and fresh Peruvian - Japanese style menu, it is a MUST rooftop to check out while in Bangkok. One of our very last nights, we checked out Above Eleven – and it was everything I’d hope for. If you know me, my kind of bar is one that’s classy, pretty and serves unique cocktails – this was it. Before actual dinner, we ordered some sushi – which was BOMB. So fresh, and like none other – definitely check them out. Just across the street from Above Eleven, you can find a fantastic wine bar and shop, located on top of Brasserie Cordonnier. 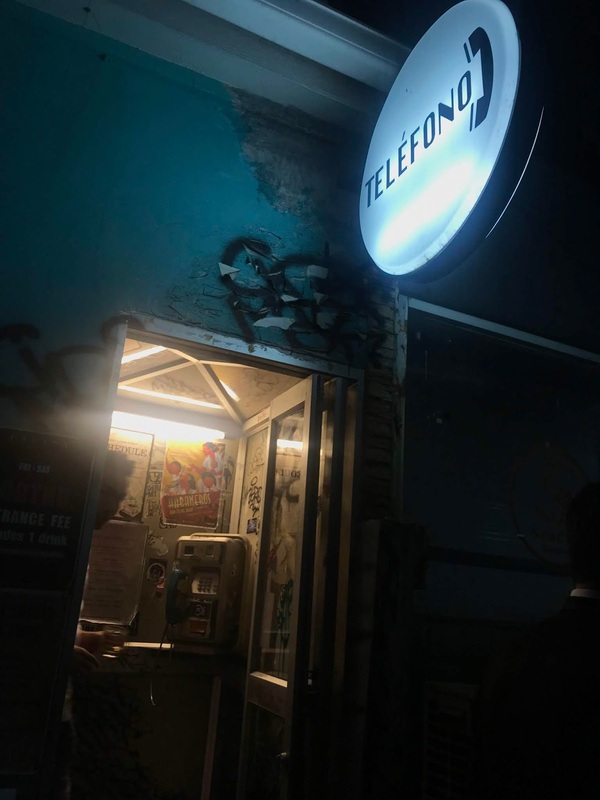 This new hot spot was inspired by an abandoned house in the South of France. You enjoy wine? The Bar Upstairs is the ultimate wine destination for all wine lovers!! 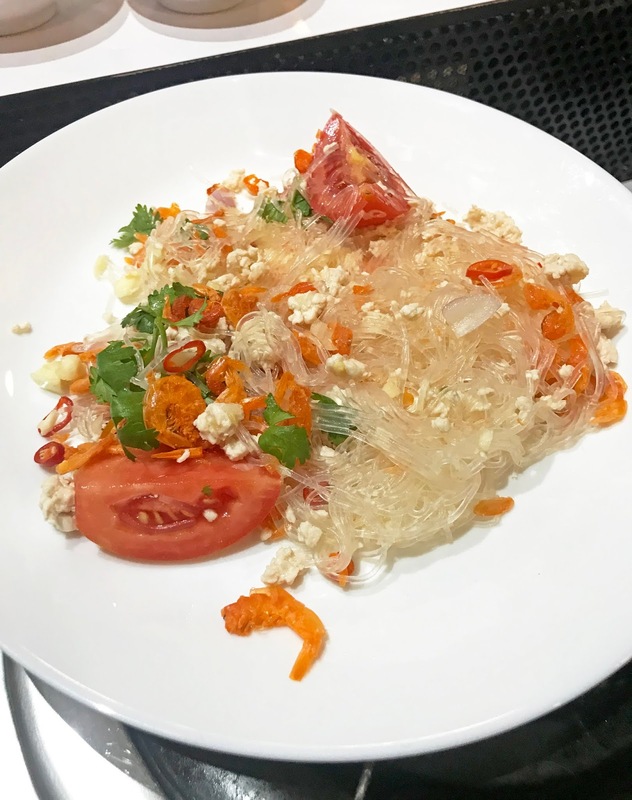 When you step inside this restaurant it’s like you are not even in Bangkok – it’s a great little get away from the hustle and bustle of the city. The Bar Upstairs features a wine menu paired with comfort food from Brasserie Cordonnier’s French Kitchen. While we were there, we had the opportunity to check out their new concept, the DIY picnic experience. The picnic basket is an option on their menu and features an array of cold cut, cheese, salads, bread and dessert – a picnic lover’s dream basket! 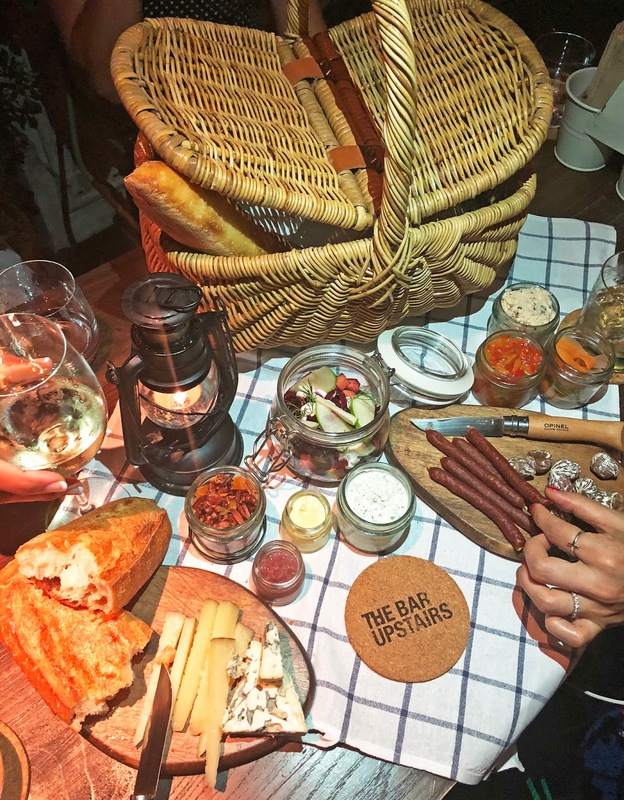 While there is a great selection of food on their menu, if you want to fully enjoy and experience The Bar Upstairs, the picnic basket is a must. Like mentioned, Thailand is best known for its food. Another way to explore Thailand’s exotic and flavorful cuisine is by experiencing authentic Thai life on a floating market tour. 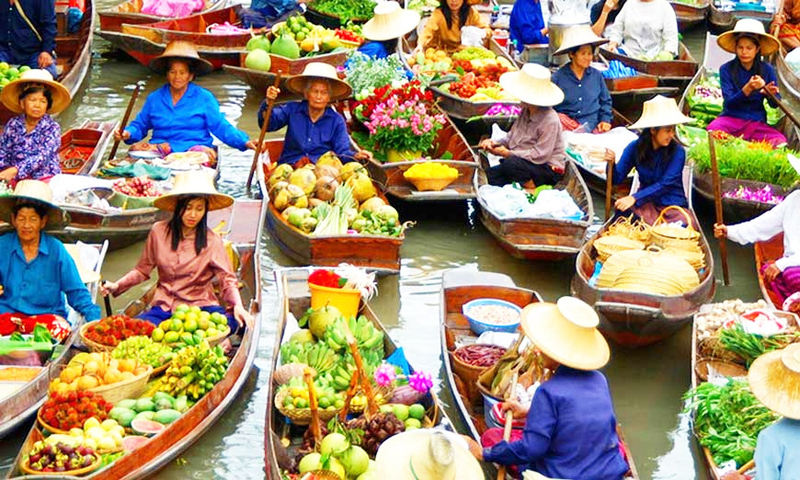 The Damnoen Saduak Floating Market is Thailand’s Best known floating market. It’s huge and lively and definitely worth checking out! Another great tour is The Amphawa Floating Market, which is the second most popular market in Thailand. 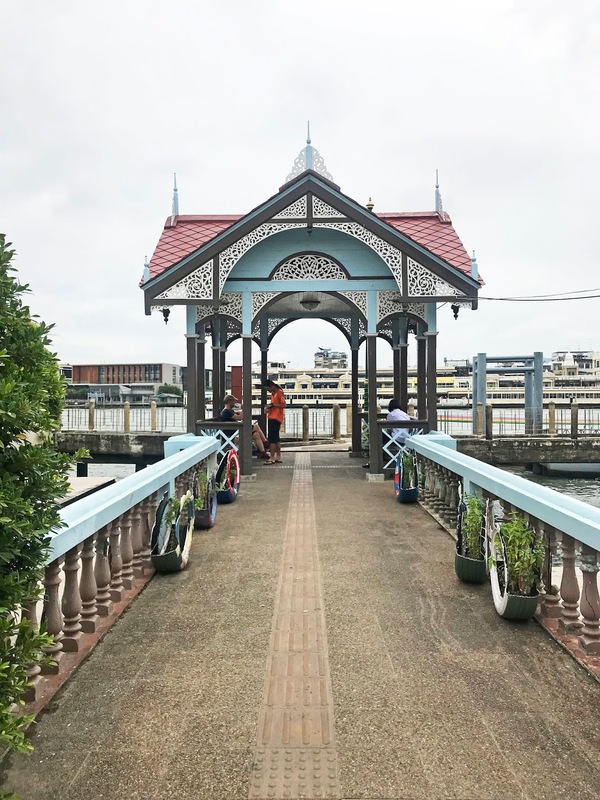 Because the floating markets are only opened on the weekends, I did not get a chance to visit one while I was there – BUT I heard these are a must! If you’re unfamiliar with the term, Floating Market, it’s just as you could imagine - a market of boats selling food and fruits. It’s said to be lively and colorful – so don’t forget to bring your camera! Make sure you use code: ‘fnancistapriv’ at checkout for an additional 10% off your purchase. 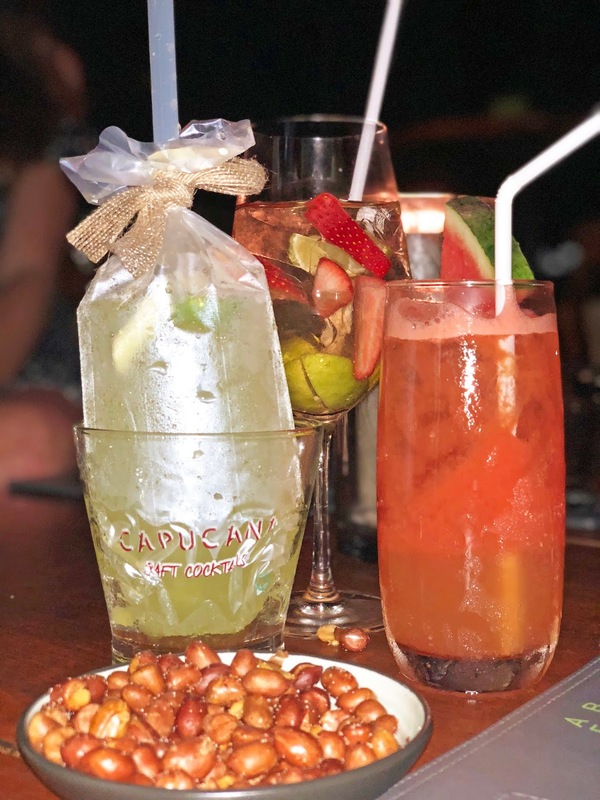 Discovering Bangkok’s nightlife is very similar to any other busy city – one place that I definitely will not forget and was a top favorite is Havana Social. Located in a little alley right in front of Fraser Suites, you’ll find a chill, speakeasy Cuban style bar. Great live music, excellent cocktails and such a good crowd – can’t miss! If you like a good hidden gem, this is it! While in Bangkok, I had the opportunity to stay at two of the best hotels, see below. W Bangkok: If you are familiar with W Hotels, they have one in Bangkok and it’s absolutely gorgeous! With very colorful and chic décor, W Bangkok is the perfect playground for jet setters and fashionistas. This luxury hotel offers an array of accommodations with modern amenities. View more of this hotel and my review here. Oriental Residence Bangkok: One of the most classiest and elegant hotels in Bangkok. Located in the heart of the city, Oriental Residence Bangkok offers luxury serviced residences. View my latest post to find out more. Bangkok is more than just a bustling city – it’s a charming and unique city with exotic and memorable sites to see! Have you been to Bangkok? If so, what is your favorite thing to do? What other things do you recommend? Let me know in the comments below! Disclaimer: Some of the content above was sponsored, but as always, all opinions in this review are my own. Special thanks to the guys at Voyagin, the Soho Hospitality team, Go Bangkok Tours for taking care of us during our visits.